How do you find the right Aussie Outback Tour? Good question. Australian Outback Tours are available in all shapes and colours. The range of choices is impressive. Your Australia Outback tour may take a few days or many weeks, and it can be as adventurous or as luxurious as you like. There is also a huge amount of destinations to choose from... Most of the Australian continent is considered to be Outback, so no single Outback tour will cover it all. People often ask me for recommendations. Now, without knowing people well it's near impossible to recommend anything. Also, I am not a travel agent and not a tour specialist. My website and books are for self drivers. That's what I know about. But because I do what I do I have learned a bit over the years about different Australian Outback tours and tour operators. I don't know them all and I don't have answers for everyone, but I do have a few tips. The first option to get away from the masses and off of the beaten track is to head out into the Wild West. Western Australia is a LOT less touristy than the Northern Territory and especially the north is a LOT less accessible. In my (strong) opinion a trip from Perth to Darwin or Darwin to Perth is BY FAR the best trip you can possibly do in Australia if you are looking for truly stunning landscapes and remote REAL wilderness. 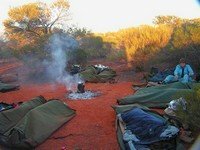 a fair dinkum camping trip (sleeping in tents or in swags on the ground, not in crisp linnen in luxury tented camps for the discerning traveller). a tour that gives you plenty of time to hike, swim and explore. Basically, the more it is like a self drive camping trip, and the less like a tour, the better I'd like it. Several operators offer Kimberley adventure tours along the Gibb River Road, leaving from Broome or Kununurra, one way or return, and they also offer longer trips from/to Perth or Darwin. They take you up to the Mitchell Plateau and actually allow a whole day to explore, they bush camp in favourite places of mine like for example at the King Edward River or they stay in luxury tented camps. On some of those trips you get pampered on others you'll be expected to pull your weight, unload the truck, collect wood, build the fire, give a hand with the meals and clean up etc. I would like to give specific recommendations here, but fact is, I have never been on a tour myself. I have had positive feedback from readers for just about all operators that do offer Gibb River Road tours.It's just a matter of matching the right operator to the right clients. If you need help with that, then your best bet is likely to get in touch with a specialist travel agent or with the Brome or Kununurra visitor centre. They are a lot more familiar with all the commercial operators than I am. You name it, he's been there and is happy to take you, along the back ways, to the most hidden corners that no other tourist will ever find. No matter how much or how little time you have, you can put your own itinerary together, or just tell him which highlights you don't want to miss and leave the rest to him. You'll probably see more that way! One company that I really like here is Mulga's Adventures. This 3 day Uluru tour would be ideal for young backpackers and working holiday makers on a restricted budget. You get to do all the beautiful long hikes (see the Kings Canyon and Olgas pages for more info), you swim in the Garden of Eden, you sit around the camp fire at night and sleep in swags under the stars. They leave daily from Alice Springs so there aren't any problems with timing your schedule. If you need transport, flights or bus tickets they help you with that as well without applying any commission charges. And they also own Annie's Place, by far the most popular backpacker hostel in Alice Springs. If I was still in my early twenties, that's who I'd sign up with. Well, and if you are nothing like me or if you shudder at the idea of having to put up your own tent, don't worry :-). There are other options. Most people want to tick of as many sights as possible. And no matter how much all the Australian Outback tour operators try to differentiate themselves in their brochures, at the end of the day most tours really are very similar. Especially the one to three day tours around Ayers Rock, or up north around Kakadu/Litchfield/Katherine Gorge. The best way to get a feel for how much any Australian Outback tour operators care about their customers is to get in touch with them, and see how they handle inquiries. I always email people before I spend money with them, and see what my gut feeling tells me. I also like looking at their websites. It's amazing how much of a feel you can get for the people who are behind the whole operation. I prefer smaller family owned businesses, for both tours and accommodation, to the big Australia wide corporations. The smaller businesses take more pride in what their area has to offer. Their employees stick around for longer and know more. The whole experience just goes a lot deeper than the standard tick-of-the-main-attractions tour. If you look for the real thing, not the touristy Australian Outback, then look for an Outback safari tour away from the big sights. Rather than booking a flight into Alice Springs and the usual round trip taking in the usual attractions, look for a trip that takes you from A to B along the back roads. I gave recommendations above mostly for the northern areas, but there are others out there that cover the south or east as well. Some of those tours spend a week, or two or even three out in the bush. Don't look for the tour that packs in the most stuff, in the least amount of time, for the least money. Believe me, you underestimate the distances and overestimate the quality of the roads. You will spend so much more time in that bus than you expected. Go and search for tours on horse back or camel back if you want something different and really want to get away from the masses. Try to get a seat on the mail plane. That's always a great one. And if the main reason that you wanted to join a tour was that you felt it's to dangerous to go by yourself, then study this site a bit more and reconsider. At the end of the day no Australian Outback tour can beat what independent travel has to offer!